A concrete school yard at Monsignor Fraser College is set to be redeveloped into a park that will be shared by the school and community under a 21-year joint use agreement between the City of Toronto and the Toronto Catholic District School Board (TCDSB). 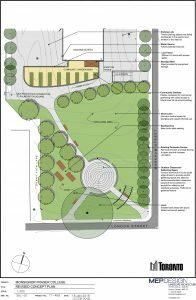 It will be paid for with funds from the city’s parks and recreation budget, and the city will be responsible for maintaining the greenspace once it has been developed. The plan dates from 2016 when the TCDSB and the school first had a meeting with the community about greening the space. The school and board initially sought funding from the Ministry of Education, but could not get the money. They also approached the community and tried to find independent sponsors, again to no avail. Davis and representatives spoke to Cressy at that meeting about whether the city could help. It was a natural fit for Cressy, who advocates for the need to have more greenspace in the ward and sees the potential of this type of arrangement. The design was initially chosen in 2016 by stakeholders, the school board, and Cressy, though some updates have been made since then.